Wolves are members of the family Canidae. Early taxonomists recognized about 24 New World and eight Old World subspecies of Canis lupus, with four subspecies thought to occur in Alaska. Recent studies of skull characteristics, body size, and color suggest that differences are slight with considerable overlap in the characteristics of Wolves from various areas. Only two Alaska subspecies are now recognized. Wolves in Southeast Alaska tend to be darker and somewhat smaller than those in northern parts of the state. The pelt color of Wolves living in Alaska ranges from black to nearly white, with every shade of gray and tan between these extremes. Gray or black Wolves are most common, and the relative abundance of each color phase varies over time and from place to place. Most adult male Wolves in Alaska weigh from 85 to 115 pounds (38.6-52.3 kg), but they occasionally reach 145 pounds (65.3 kg). Females average 5 to 10 pounds (2-5 kg) lighter than males and rarely weigh more than 110 pounds (50 kg). Wolves reach adult size by about 1 year of age, and the largest Wolves occur where prey is abundant year round. Wolves are highly social animals and usually live in packs that include parents and pups of the year. Larger packs may have two or three litters of pups from more than one female. Some yearlings may stay with the pack. The social order in the pack is characterized by a dominance hierarchy with a separate rank order among females and males. Fighting is uncommon within packs except during periods of stress, with the dominance order being maintained largely through ritualized behavior. Although pack size usually ranges from 2 to 12 animals, packs of as many as 20 to 30 Wolves sometimes occur. The average size pack is 6 or 7 animals. 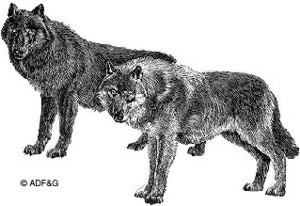 In most areas Wolf packs tend to remain within a territory used almost exclusively by pack members, with only occasional overlap in the ranges of neighboring packs. Wolves that are primarily dependent on migratory caribou may, however, temporarily abandon their territory and travel long distances if necessary. In Alaska the territory of a pack often includes from 300 to 1,000 square miles of habitat with the average being about 600 square miles. Wolves normally breed in February and March, and litters averaging about five pups are born in May or early June. Litters may include from 2 to 10 pups, but most often 4 to 7 pups are born. Most female Wolves first breed when 22 months old but usually have fewer pups than older females. Pups are usually born in a den excavated as much as 10 feet into well-drained soil, and most adult Wolves center their activities around dens while traveling as far as 20 miles away in search of food, which is regularly brought back to the den. Wolf pups are weaned gradually during midsummer. In mid- or late summer, pups are usually moved some distance away from the den and by early winter are capable of traveling and hunting with adult pack members. Wolves are great travelers, and packs often travel 10 to 30 or more miles in a day during winter. Dispersing Wolves have been known to move from 100 to 700 miles from their original range. In spite of a generally high birth rate, Wolves rarely become abundant because mortality is high. In much of Alaska, hunting and trapping are the major sources of mortality, although diseases, malnutrition, accidents, and particularly intraspecific strife act to regulate Wolf numbers. Wolves are carnivores, and in most of mainland Alaska moose and/or caribou are their primary food, with Dall sheep being important in limited areas. In Southeast Alaska, Sitka black-tailed deer, mountain goats, and beaver are the most important sources of food. During summer, small mammals including voles, lemmings, ground squirrels, snowshoe hares, beaver, and occasionally birds and fish are supplements in the diet. The rate at which Wolves kill large mammals varies with prey availability and environmental conditions. A pack may kill a deer or moose every few days during the winter. At other times, they may go for several days with almost no food. Since Wolves are opportunistic, very young, old, or diseased animals are preyed upon more heavily than other age classes. Under some circumstances, however, such as when snow is unusually deep, even animals in their prime may be vulnerable to Wolves. The food habits of the wWolf often bring it into conflict with humans who in many parts of the world are also hunters of big game animals. Although the Wolf has coexisted with big game animals for thousands of years, under some conditions the impact of predation contributes to local scarcities of game which, although temporary, arouse some people's concern. At other times, particularly in non-coastal systems with moose and caribou, Wolves serve an important role in maintaining game populations below levels at which their food supply would be damaged. As the myths that for so long dominated human thinking about the Wolf have been dispelled, a remarkable change in attitude has occurred toward Wolves in Alaska, and they are now considered a highly valued component of the state’s fauna. Various studies of Wolf ecology have shown that the balance between Wolf and prey populations is relatively fragile and can be easily disrupted. For example, severe winters may drastically reduce a big game population. Because many of Alaska's big game populations and their habitats are less productive than those in lower latitudes and because predators such as Wolves and bears are still common here, human hunters will have to accept strict limitations on harvests from time to time. In some areas Wolf numbers may need to be controlled in order to avoid relatively long periods of prey scarcity which could result in very low numbers of Wolves and other furbearers. Wolves can still be seen and heard in most parts of Alaska by those willing to spend time in remote areas. Although the future of the Wolf in Alaska is reasonably secure, some challenges and problems remain. Will Alaska habitat remain available for large contiguous Wolf populations as people expand their use of the land? The present attitudes of Alaskans and other Americans are cause for optimism, and Wolves, humans, and big game animals should coexist indefinitely in Alaska despite some conflicts inherent in their relationships.